A kitchen splashback is a purposely tiled area behind the sink or hob that protects the wall from inevitable splashes and stains. Once a functional afterthought in kitchen design, the splashback has become a tool to add style and make a statement in the kitchen. Today splashbacks are available in a wide range of materials, colours, finishes and even textures, making them more of an accessory to dress up your kitchen walls. Corian is hugely popular as a worktop surface but has all the properties required to make a great splashback too. The solid surface can be cut to almost any shape and has excellent durability, as well as being stain and water resistant. Magnet Trade has a huge choice of more than 70 colourways, to suit your taste perfectly. For a stylish option on a smaller budget, consider a laminate splashback. Available from Magnet Trade in a wide selection of bold and contemporary styles, you can choose a laminate to fit your colour scheme or stand out and make a statement. Laminate is a great alternative to tiles and the smooth surface makes it hygienic and easy to clean which is exactly what you would need behind a sink. However, do note that laminate’s plastic qualities makes it unsuitable for use as a gas hob splashback, as it should not be exposed to open flames. 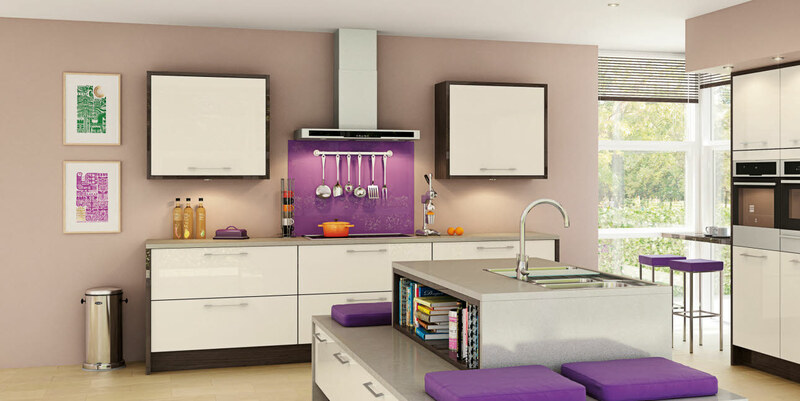 Modern kitchens might suit a futuristic stainless steel splashback and the matte metallic look is very current. Although stainless steel is heat-resistant and hard-wearing, it is worth nothing that it is not the most low-maintenance material for a splashback as it requires specific cleaning materials and is less scratch resistant than alternative options. Magnet’s selection of glass splashbacks and upstands have something to suit every kitchen style. Classic, understated kitchens might suit a Standard Glass Splashback in Pewter or Biscuit. If you’re looking to update your kitchen with a pop of colour, the Decocolour range is available in 12 glossy options including Cherry and Olive. Glass is a great all-round material for the purpose of a splashback and Magnet’s made-to-order ranges allow for a sleek, streamlined look. The strong, durable material is easy to clean and install, and Magnet have almost any size or colour you might need. No longer just a humble piece of material in the kitchen design process, the splashback can blend in or stand out as you wish, and the growing offerings might leave you a little spoilt for choice.